This is one time each fortnight where the whole school meets together to celebrate our successes. Buddy Classes are timetabled on to run the assembly. They provide presenters and an item to share with the rest of the school. Teachers nominate a recipient from each class to receive a Principal’s award at this assembly. 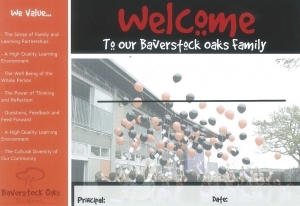 Any new students who have enrolled in Baverstock Oaks that fortnight also receive a “Welcome to our Family” certificate. We welcome parents to this assembly whether your child’s class is on or not. To find out when your child’s class is running the full school assembly, please have a look at the fortnightly school newsletter or the large notice board at the front of the school.